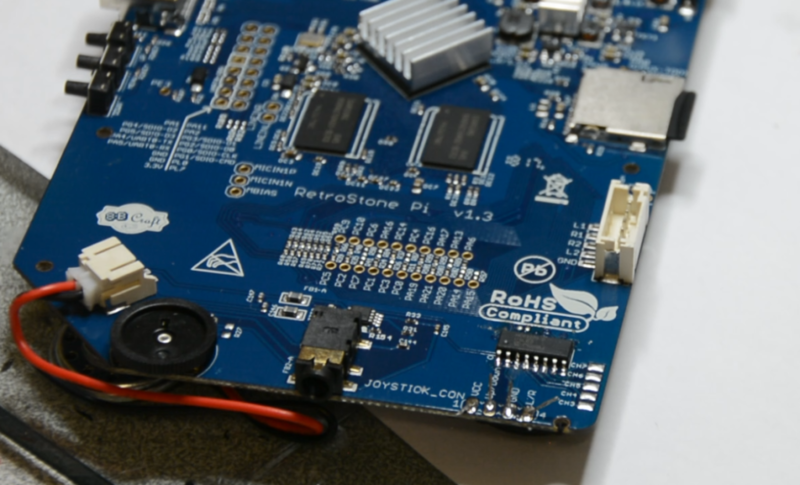 Please note that modding and/or opening your RetroStone will void your guarantee! Do it at your own risk, doing so might result in product not working anymore or even hurting yourself. I would suggest doing it only if you know what you’r doing. 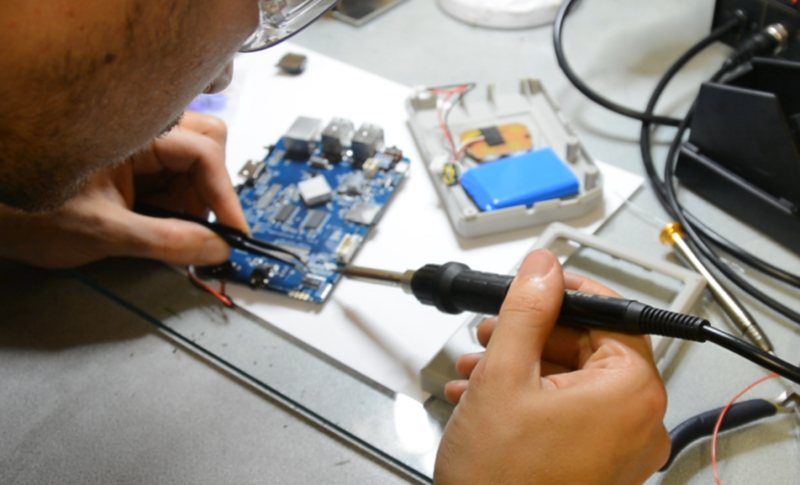 Be carefull of electrostatic, hold the PCB by the edges only and avoid touching components as much as possible. Also make sure to ground yourself. Step 2 : Remove the front casing (be gentle!) You can push the LCD down so it don’t come with the casing. 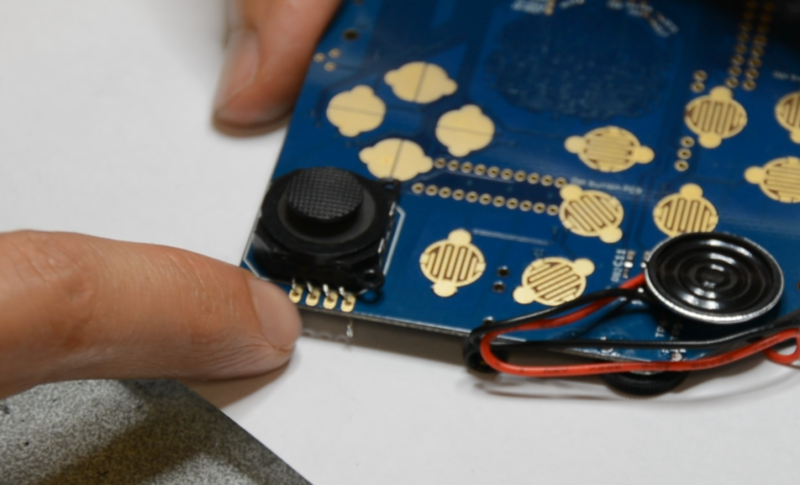 You can let the PCB in the back casing, you won’t need to separate them for additional buttons. Step 5 : Drilling might have deformed the plastic for the upper button hole (see below red rectangle). This might prevent the LCD from fitting correctly in it’s hole. Check if the LCD can fit correctly in it’s socket (you might want to unconnect the LCD to do so. 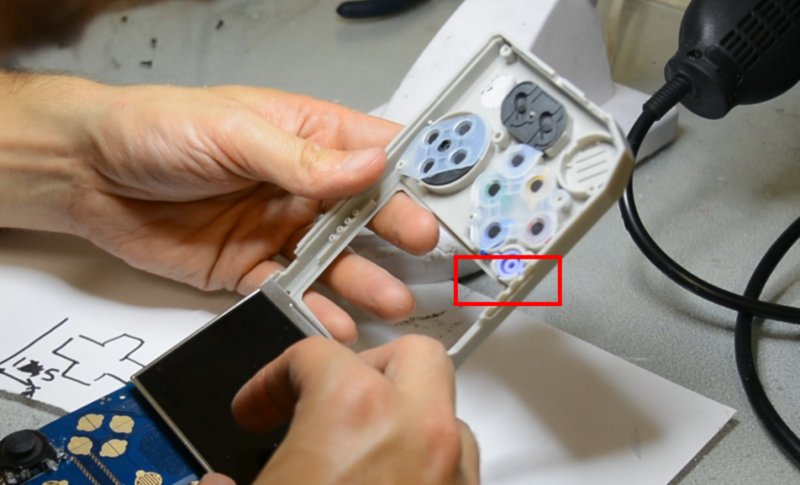 Or alternatively if you don’t want to unconnect LCD, you can just check if plastic is still flat on the LCD side of the plastic wall). 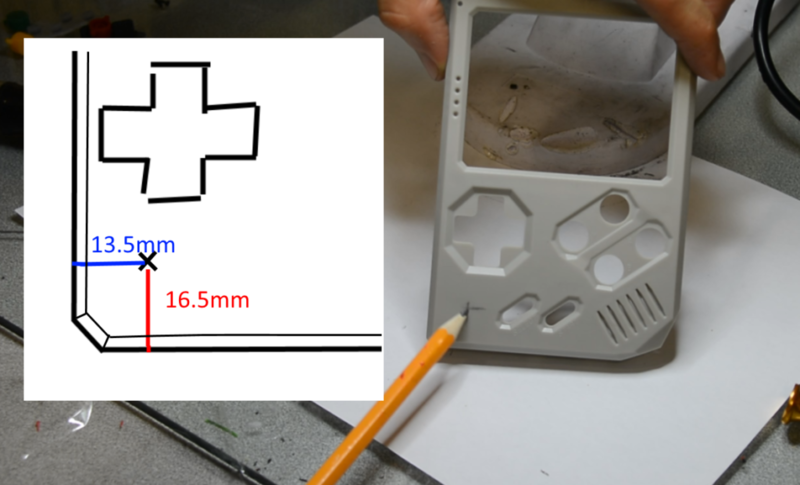 If plastic is not flat use your hand file to flatten the LCD plastic socket. Make sure the button can still move correctly afterwards. If not file again on the button side of the wall. Step 6 : Test if buttons can move correctly in the new holes without friction. 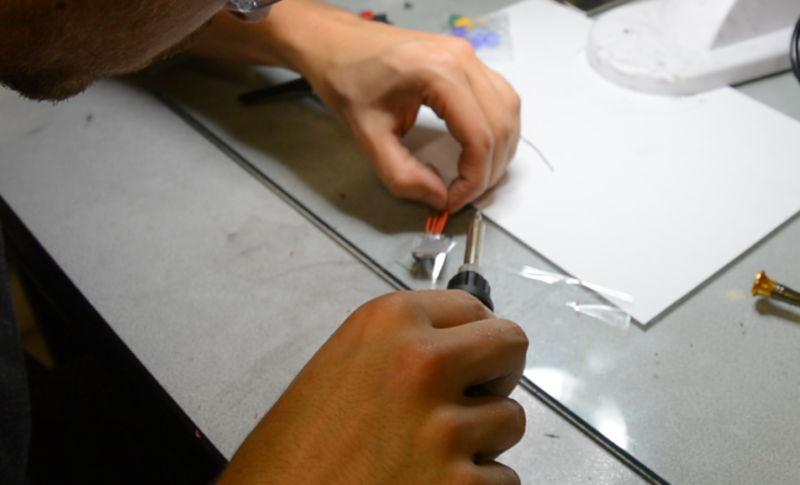 Step 7 : Cut two round silicone with conductive pads in the additional silicone. You can also cut the main silicon border so the new round silicones can fit. Step 8 : Put the silicone in place and make sure they don’t overlap with other silicones and with the screw hole/pillar. 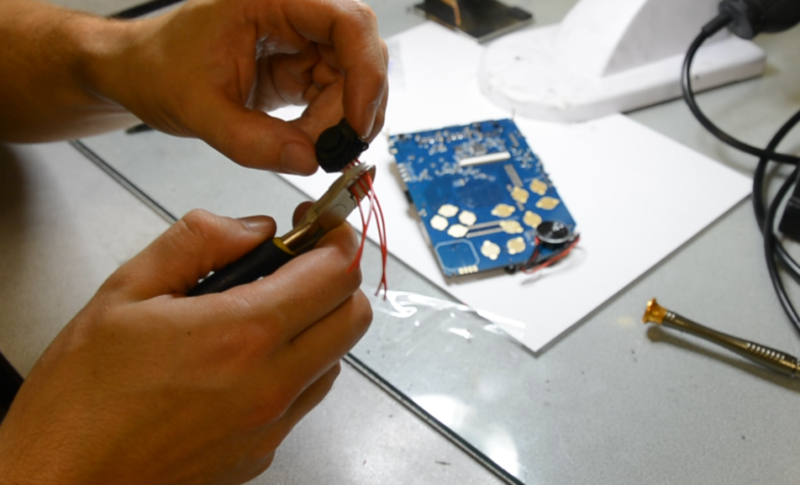 Step 10 : Bring down the PCB and backcasing together. Do it slowly so the silicon don’t move! Step 11 : Before screwing them together, hold them together and test the buttons to see if they click correctly. If they don’t then maybe you did not filed enought! Step 12 : Buttons are working OK? Just screw the back casing. Don’t screw too hard! Or the plastic will be torned and screws won’t hold anymore. 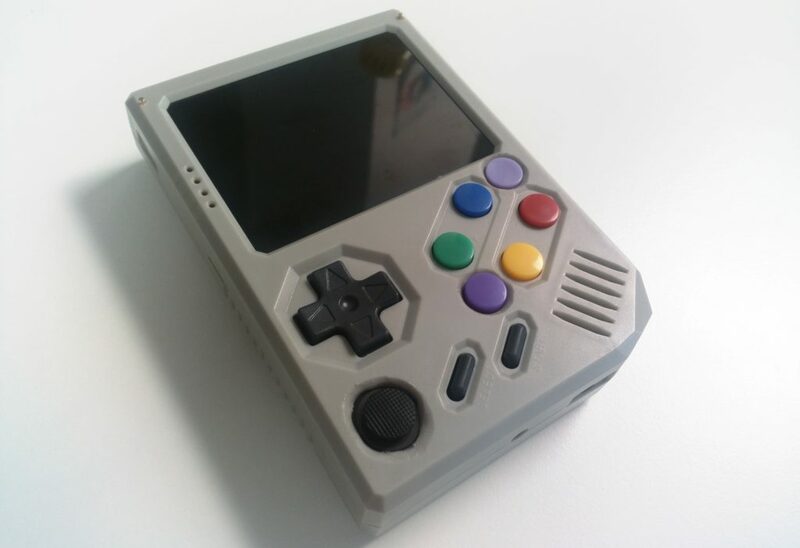 The buttons should work out of the boxe, just go to emulation station, press start, go to “configure input” and map the keys including the 2 new buttons. IMPORTANT : Joystick driver is not yet functional! Step 4 : Drill the hole with wood bit. For the joystick model I’m using you need a hole of 12mm for the joystick to move correctly. You can use 12mm wood bit or 10mm bit and file a bit. Step 6 : Disconnect the LCD. 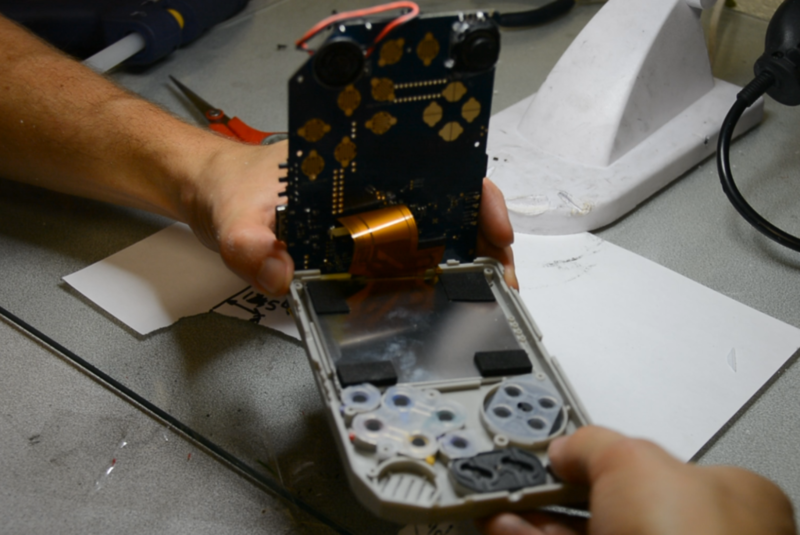 Step 7 : Flit the unit over and remove gently the back casing and disconnect back buttons and battery. 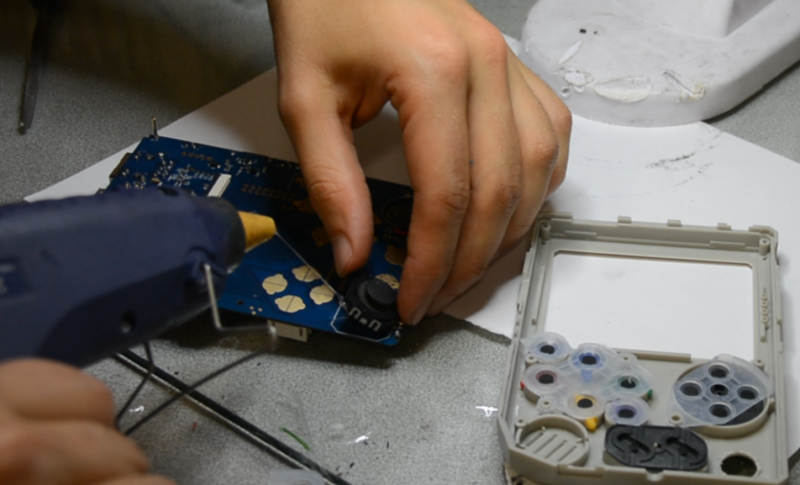 Step 12 : Make sure the joystick is centered very well on the PCB layout (the white printing) before soldering! 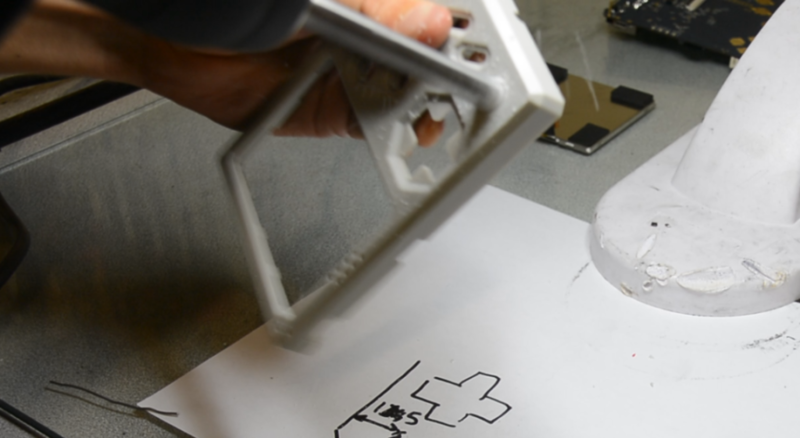 Step 13 : Add a bit of hot glue to hold down the well centered joystick. 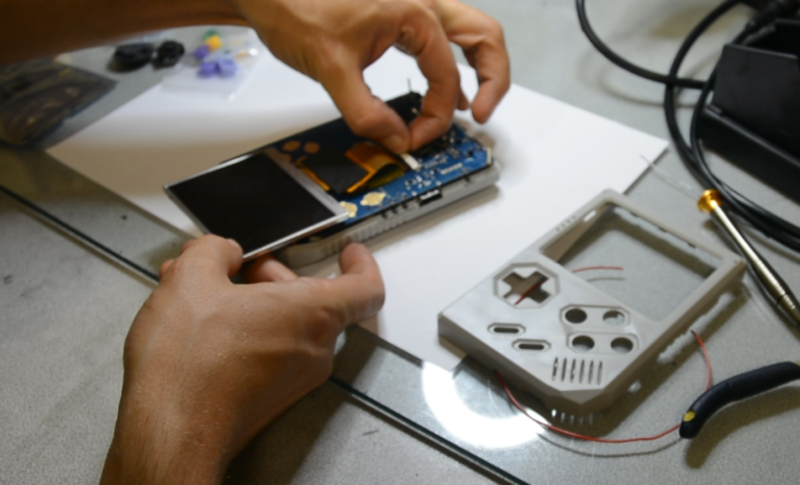 Step 16 : Reassemble : first put all buttons and silicons. Then put the LCD back in it’s socket. 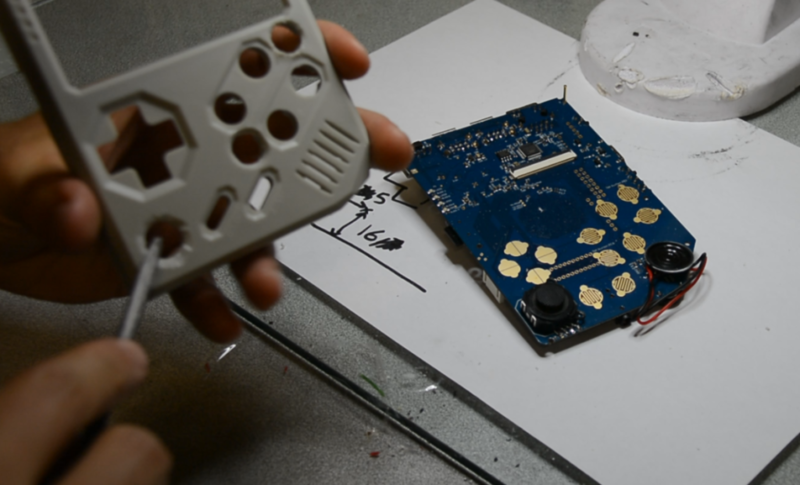 Step 17 : Bring down the PCB and backcasing together. Do it slowly so the silicon don’t move! 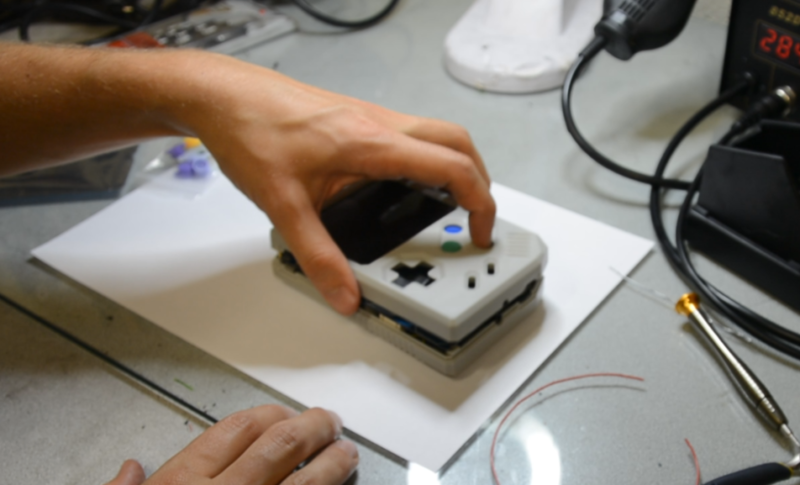 Step 18 : Before screwing them together, hold them together and test all the buttons and the joystick to see if they click/move correctly. If they don’t then maybe you did not filed enought! Step 19 : Everything OK? Just screw the back casing. Don’t screw too hard! Or the plastic will be torned and screws won’t hold anymore. The buttons and joystick should work out of the boxe, just go to emulation station, press start, go to “configure input” and map the keys including the 2 new buttons.